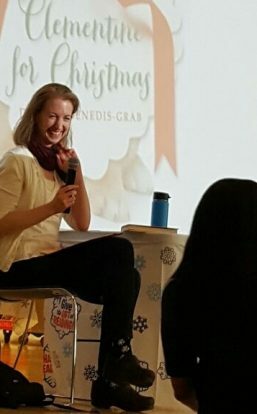 Speaking to students about books and writing is one of my very favorite things to do! My PowerPoint presentation, meant for groups small or large, is about an hour, though time and content can be changed if needed. I share how I became a writer and how I use my life experiences to create my books. I can do a short reading and like to have at least twenty minutes to answer student questions. I also sign books. This program is best suited for grades 2-5. I can also lead Writing Workshops. During my MFA studies I took classes on teaching and while I love my work with college and graduate students, I also love helping younger children discover how their experiences and ideas can create powerful writing. This program is meant for smaller groups of no more than twenty-five and can be tailored to any grade. Daphne Benedis-Grab is simply charming! She is a brilliant author that loves to share her experiences as a child that helped to shape her own stories. The kids fall in love with every single book. She is honest about her process and teaches children that editing is the key to making a great story. You do not want to miss the opportunity to host this amazing author! Thank you so much for your visit this morning! The teachers had such positive things to say about you and your book. I’ve even had a few parents comment how much they enjoyed reading with their kids as a family every night. The kids commented about how nice you were as well! Thank you for making it such a positive experience. Never in a million years would I have expected it to turn out so incredible! Many, many thanks for your time yesterday. Your presentation to the children was perfect in every way and you could tell they really enjoyed it. There were so many thoughtful questions! We’d love to have you back again if you are interested.